This entry was posted in hoster, weapon and tagged leather, M1911. Bookmark the permalink. She is absolutley beautiful – Love the look!! 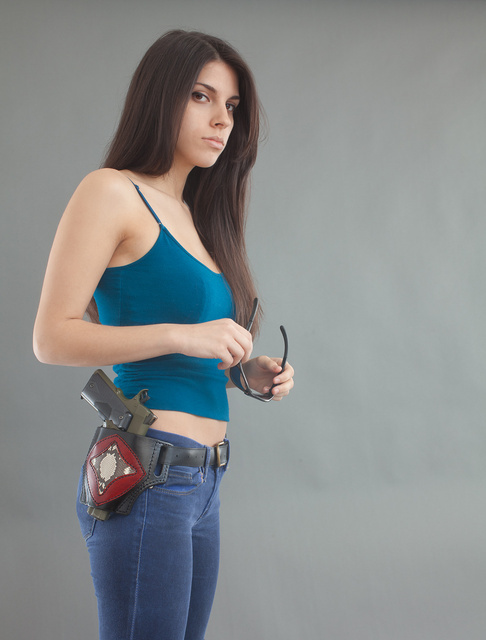 Gorgeous model, holster and 1911. 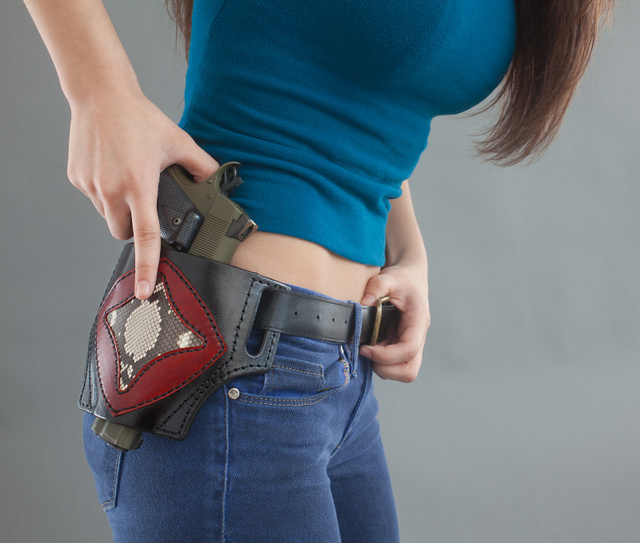 Both the Holster and the Models are gorgeous, but that grip is driving me to distraction. I don’t get it James. What is it about the grip? Looks like a Crimson Trace Laser Grip. Oleg is my hero. Great gun’s, great camera’s, and great women. James, she is new to firearms. Range trip Sunday should start addressing that. We’ll also get the belt upgraded. And speaking of training, I spent half a day at Sniper Pro team exercises. Very, very good. I definitely recommend their courses — especially if they are local to you. Looks like a nice holster, but not a fan of the slide style. The front site can get snagged on a hasty draw under duress unless there’s specific relief designed into the holster. This looks a bit too form fitting and snag could be a risk. Given that the holster is 2 panels, I can understand where it *looks* like it would snag. But I can assure you that the way its designed, the front sight comes up via a natural tunnel/relief where the two panels are stitched, and a snag is *very* unlikely, unless you twist the gun as you’re drawing and actually rotate it on its axis almost 90 degrees, which os also unlikely as its boned in fairly tightly. But, don’t take my word for it…there are links to reviews on my site page for the FlatJack. E-mail any of the reviewers, and ask them how it is.